Well, let’s see. How do I even begin? I know you knew this post was coming. And really, you had to know I’d use that image, right? If you know me at all and/or follow me on any kind of social media, the answer to all of those things is probably yes. 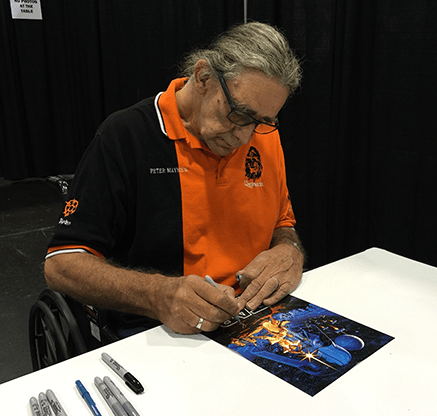 I took about a month’s hiatus from blogging after I went to Star Wars Celebration. I think I needed it. I just couldn’t really put into words how awesome those four days were for me, for a lot of reasons. But here’s where I try. I left for Star Wars Celebration very early on Thursday morning. I was ready. I zoomed through airport security, had coffee, and I was on my way. As a huge Star Wars fan, I was very much looking forward to this event. I was also planning to go to Disneyland for the first time. I had a lot of plans. Some of them happened, some of them didn’t. When I first heard about all the actors from the movies that were going to be at Star Wars Celebration, I decided I needed to meet a few of them and get some autographs. I even had the perfect thing to get signed – this Star Wars poster that I had framed and hung on the wall in my home office along with some other Star Wars memorabilia, including a Star Wars nesting doll I got at a market in Russia, toys from Burger King (I have the whole set from both the original trilogy and the prequels), and some Disney-themed toys from Star Tours at Disney World. It’s basically my “Star Wars wall”. But having the poster, the centerpiece, signed would make it even more impressive. Unfortunately, autographs were expensive. So I ended up only signing up to meet and get autographs from Carrie Fisher (Princess Leia, for the uninformed) and Peter Mayhew (Chewbacca). Still, I was pretty excited about it. Since I hadn’t been to Disneyland yet and my hotel was right across the street, I decided I’d actually spend a couple of days at Star Wars Celebration and a couple of days at Disneyland. The plan was, arrive on Thursday, stand in line for my autographs and get those taken care of, then browse the exhibit hall, maybe go to some panels, then see the first two prequel movies that night in 3D. Friday I would head to Disneyland and then come back to see Episode III in 3D. Saturday my friend Sarah and her son Elliott were planning on coming to Anaheim and going to Star Wars Celebration also. They’re big Star Wars fans as well. Since I knew they had passes for Disneyland, I invited them to just stay in my hotel room (I had two queen beds) and go there with me the next day. So that was the plan. Thursday was a blast. Everyone at Star Wars Celebration was just so excited to be there. People had waited in line overnight for the opening panel which was expected to also show the new teaser trailer for Episode VII. I ended up watching part of the panel outside the convention center on my phone, but they cut it off right before they showed the trailer so that only the people inside got to see it first. Doh! But in the excitement to get in, I quickly forgot about it for the moment. I grabbed my media pass and headed to get my autograph tickets. First up was Peter Mayhew. I was about the tenth person waiting in line to meet him, and he was brought in in a wheelchair after the opening panel. Poor guy. Of course, all of the stars from the original trilogy are getting up there, since the first movie did come out in 1977 (before I was born), after all. And this guy is pretty freaking tall. I read that he had double knee replacement surgery a couple of years ago, so it sounds like he’s had a lot to deal with. Anyway, I digress. We know he’s in Episode VII, so he must still be doing somewhat okay. Meeting Peter Mayhew was pretty fun. I managed to snag a couple of pictures of him signing my stuff, and I even got him to make the wookiee noise for me. Too cool! I had some time before Carrie Fisher was signing, so I went and browsed the exhibit hall for a bit, then came back. I would try to describe the exhibit hall, but honestly, there’s just no describing it. It’s basically heaven for Star Wars fans. Your best bet is to check out all my pictures from the trip and see for yourself. I waited in line for Carrie Fisher for quite a while, even missing a panel I had wanted to go see. But, while standing there, I did get to see the actors on either side of her signing table, Ian McDiarmid (Emperor Palpatine) and Anthony Daniels (C-3PO). My only experience with any of the actors before was when I went to see Star Wars: In Concert a few years ago, which Anthony Daniels hosted. It’s interesting seeing C-3PO in person. That experience was also pretty amazing. Anyway, Carrie finally made it. She is… a very unique person. (That’s putting it nicely.) She’s fun, though, and we just let her be weird, because after all, she is Princess Leia. The day I was in line to get her autograph, she was sprinkling glitter on everyone’s head. I heard from some others that another day she drew rings on people’s fingers with marker. Oh, Carrie. It was neat to meet her, though. So, here is my signed poster that I have hanging in my office now. 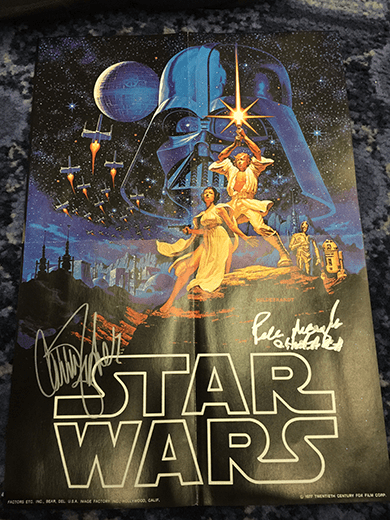 I plan on attending Star Wars Celebration again in the coming years, so hopefully there will be a few more autographs on it one day. After meeting Carrie Fisher, I headed over to get in line to watch Episodes I and II in 3D. I had fun hanging out with the people in line by me, but I ended up getting really tired during Episode II (hey, I got up early to go to the airport) and leaving before it was over. Oh well. Friday I headed to Disneyland! My friend Garrhet, who lives in LA, had seen on Facebook that I was heading to Star Wars Celebration and asked about hanging out while I was there. He ended up taking the day off from work on Friday and went to Disneyland with me. We had a blast. I hadn’t seen him in something like ten years or so, but we were able to pick right back up where we left off and had a great time hanging out. So much so, in fact, that I ended up skipping Episode III in 3D (also probably partially because I didn’t feel like making the long walk from Disneyland to the convention center) to go to dinner with Garrhet in Downtown Disney. I even had a really great beer from Bottle Logic with my dinner. Another awesome day. Saturday morning I met up with Sarah and Elliott. They had both dressed up a bit for Star Wars Celebration. Sarah got plenty of attention in her hipster Leia costume, complete with shirt that said “Got Buns Hun?”, and Elliott made a great dapper Jedi. There were so many costumes and so much to see in the exhibit hall on Saturday that we didn’t even make it to any of the panels that day either. But we still had a blast and got a ton of pictures. It was so much fun hanging out with them, and definitely great seeing one of my long-time friends again. Sarah and I have been friends since before Elliott was born. Oh, and don’t let me forget one of the big events of the day. See, earlier in the week, before heading out for the convention, I’d made a last-minute decision. Sarah had gotten diagnosed with breast cancer last year, and I hadn’t seen her since right after her diagnosis. Since then, I’ve followed along on social media as she’s gone through chemo, surgery, and then radiation. She was still going through radiation when we were at Star Wars Celebration. So, I thought it would be fun to surprise her with something – something that would have a benefit for me too. 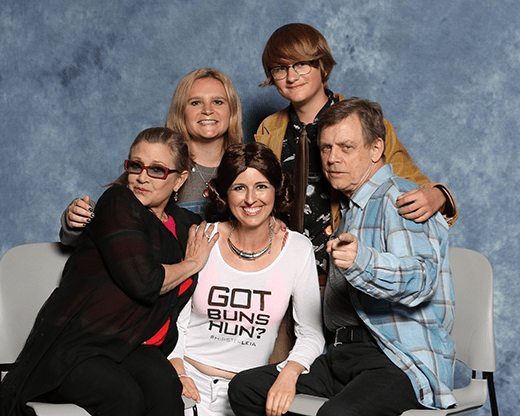 I decided to buy a photo op with Carrie Fisher and Mark Hamill (Luke Skywalker) and have all of us in it with them. I told Sarah I had a surprise for her on Saturday evening, but I wouldn’t tell her what it was. We got in line for the photo op at our assigned time, and Elliott figured out what was up from the sign. Sarah didn’t realize at first we were actually meeting Mark and Carrie, but thought it was just some people dressed up since the sign said it was for the “Skywalker twins”. We corrected her, though… we were actually going to get our picture taken with the real Luke and Leia! You can imagine how excited the people in this line were. When it was finally our turn, it all happened really fast, but Carrie did love Sarah’s shirt, and we enjoyed meeting them, even for a brief moment. It was so much fun, and everyone that went in right before and after us was just as excited about it as we were. What a great opportunity, and a great photo out of all of it!